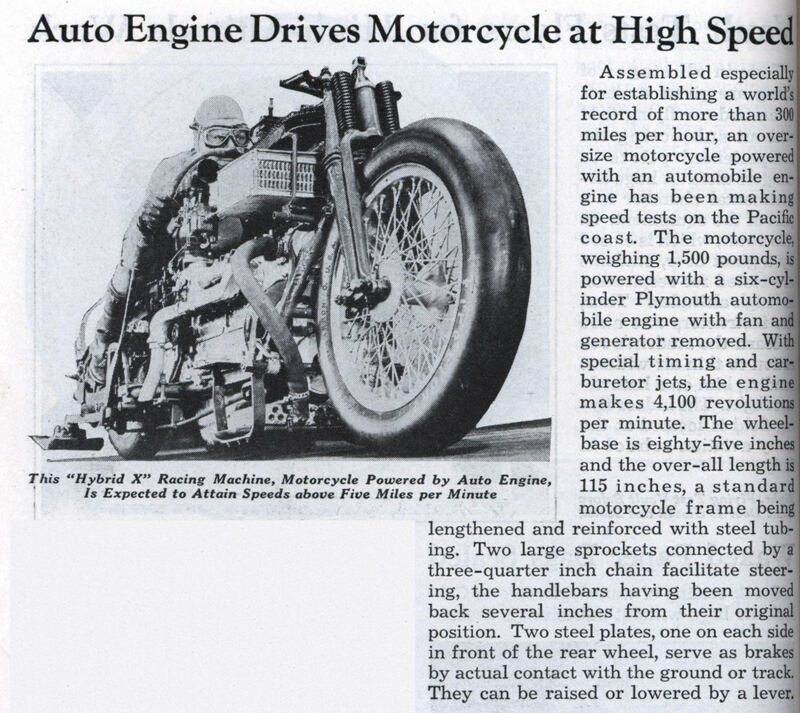 Assembled especially for establishing a world’s record of more than 300 miles per hour, an oversize motorcycle powered with an automobile engine has been making speed tests on the Pacific coast. 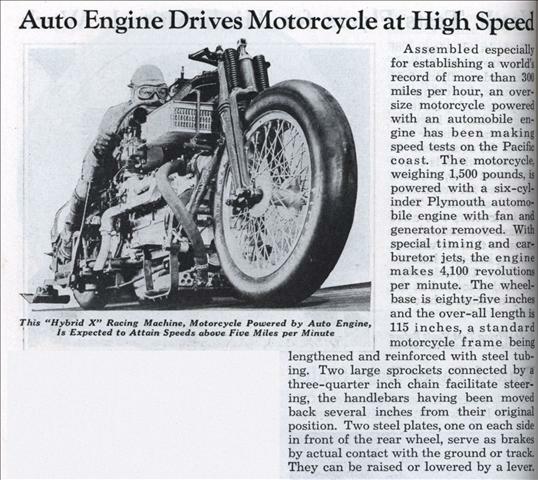 The motorcycle, weighing 1,500 pounds, is powered with a six-cylinder Plymouth automobile engine with fan and generator removed. With special timing and carburetor jets, the engine makes 4,100 revolutions per minute. The wheel-base is eighty-five inches and the over-all length is 115 inches, a standard motorcycle frame being lengthened and reinforced with steel tubing. Two large sprockets connected by a three-quarter inch chain facilitate steering, the handlebars having been moved back several inches from their original position. Two steel plates, one on each side in front of the rear wheel, serve as brakes by actual contact with the ground or track. They can be raised or lowered by a lever. Very interesting! 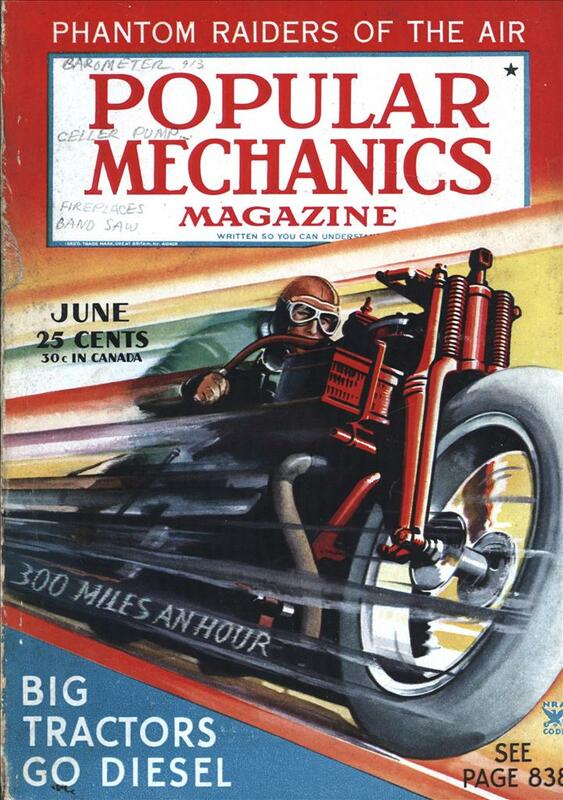 I didn’t know that the idea of putting car engines on motorcycles was that old. Wow, sort of like the 1930’s version of the Chrysler Tomahawk. I wonder how they would do against each other in a race? Wow, this is awesome. I wonder what was the max speed it get.. Did it break the world record at that time? This motorcycle is a ancestral of the BOSS HOSS. The BOSS HOSS is a “monsterbike”, using a GM V8 (455hp)!! It seems that Americans exhausted all possibilities of the gasoline engine long ago! Time now to turn to the electric bullet train and dwellings for factory folk within it’s reach! I expect contract, in-factory dorm workers to be the norm in America in the next few decades, just to compete with the ultra-economical Chinese all female workforce! No room here for the Great Hulking American Neanderthal of 6’+ and 250+ pound stature, this is a computer assisted workplace for the small quick bright and nimble! The machines do the bruit force and proper planning does away with the old drudgery we were once bred for! They require only healthy fruit and veggies diets with rice to fill in the tummy! Smaller faster brighter folk will prefer to ride than drive home and need pre-planned rest periods of a month not week-ends to restore, and will work for months to get them! Asia’s success is the careful exploitation of these little folks, and America’s downfall, the 8 to 5 and shift work in the ‘burbs format. Our falling dollar is proof positive that change in America is needed just to survive this new ultra fast, ultra smart world! This old “Flathead’ antique in a bike frame is the indicator of where we were, question is have we progressed very much farther in recent years? Holy ****. “Two steel plates, one on each side in front of the rear wheel, serve as brakes by actual contact with the ground or track.” Somehow I doubt that whoever was unfortunate enough to test ride this thing survived. Imagine hitting these “brakes” at 300mph. Well, that bike apparently didn’t attain a single speed record. At 1935 speed record was ~159mhp by Ernst Jakob Henne and 300mph was attained in 1975 by Don Vesco.